Two of my submissions to the upcoming Green Show at Falls Church Arts have been accepted. The interpretation of “green” is left up to the artist. I chose landscapes, although one of them is not very green. I also consider my paintings to be eco-friendly because I use water mixable oils. The first I painted last Spring. It’s a view from the Devil’s Knob overlook in Wintergreen where everything was green and the red buds were blooming. 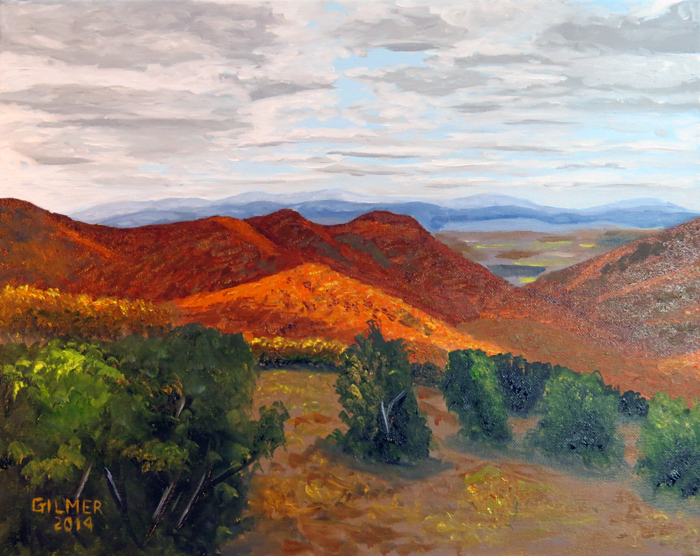 The second is a painting I did a few months ago from a photo I took on the Skyline Drive in the Fall of 2013. The show is at Art Space in Falls Church located at 410 South Maple Avenue, Falls Church, VA 22046. It opens on February 12th and I plan to attend the opening night reception. It runs through March 8th. 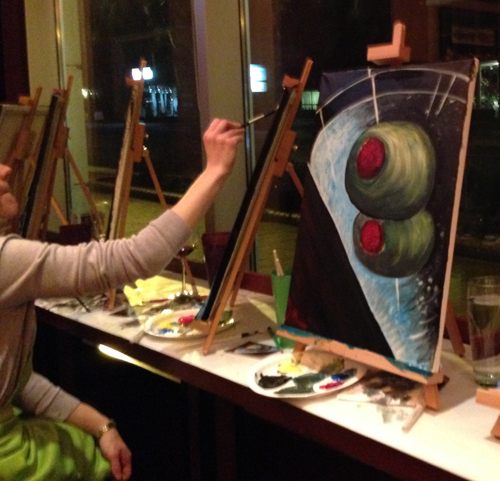 Around the time I got serious about starting to paint again I met my friend Dede Haas for drinks. I knew Dede through my networking activities while I was running my company. She is a consultant to technology companies specializing in channel sales, but she took a couple of years off while back to explore her love of photography. Her work is fabulous. Dede also lives near me and when we met she told me I should get involved with Falls Church Arts. I decided to enroll in a class taught by Jean Marie Barrett called painting from the inside out. The premise was painting scenes looking out through windows and doors. It was a fun and challenging class and served the purpose of getting me back into painting again. Painting with Jean also served to build my confidence. Whenever I would cower in my lack of ability she would simply tell me I had the skills to do something and I should just do it. I painted two paintings in that class. Interestingly enough, they were both from photos taken at Il Casale di Mele on a trip to Umbria Italy a few years ago. The first one is looking out the kitchen window. That’s my friend Sophie at the counter. This was my first painting in the class. In my opinion it’s not very good, but it did serve to get me back into practice. The second piece I did is one of my best paintings ever. I’m not sure I would have even attempted it if it had not been for the confidence Jean instilled in me. This was done from a favorite photograph from the trip looking out a huge plate glass window from the dining room into the garden. At Jean’s suggestion, I timidly entered it into the Falls Church Arts All Members Show (Spring 2014). It didn’t win anything, but I was quite proud. This was my first show. 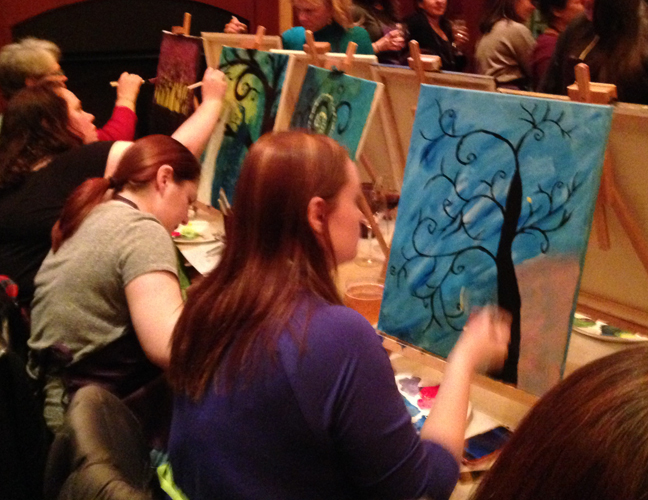 Last night Mad Fox Brewing Company, a craft brew pub near where I live, had a painting party. 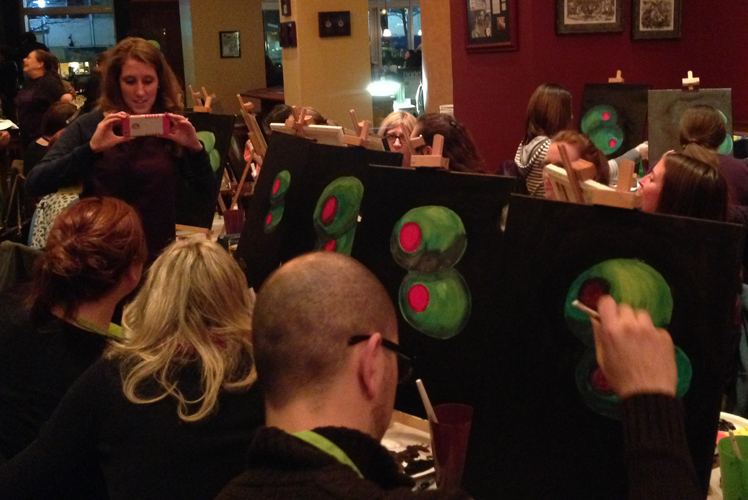 They brought in a company called Creative Mankind, who conducted a two-hour workshop where people could paint. No painting experience was necessary. I was curious enough to sign up. First of all, it was very popular. There were probably close to 50 people who had signed up. Creative Mankind set up spots with tabletop easels, a canvas, water, brushes, and acrylic paints including black, white, and the primary colors (red, blue and yellow) on a paper plate pallet. They also had a small photo of olives in a martini glass for each person. Once they got us all organized they gave some instructions and we all got started. The subject was simple enough that even beginners had good success. 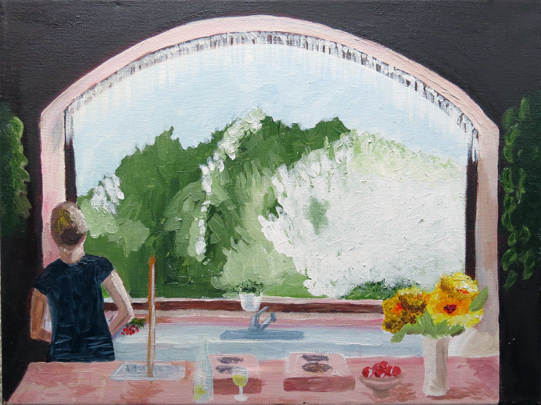 We started out painting the olives, then we painted the background, and finally we painted the glass and the reflection. Most people did pretty well as you can see from the photos. I love the fact that organizations like Creative Mankind are encouraging people to explore their creative side. A good time was had by all! In 2002 I decided that I needed to take some basic art classes. I was in the middle of starting my own company, so I had my hands full, but somehow I found time to sign up for a drawing class with the county adult education program. It was called Drawing to Paint, and the teacher was Jennifer Schoechle. I expected to do to class to learn to sketch so I could paint better. It was quite different from what I expected, but it was very useful. The class was based on chiaroscuro, which is the use of strong contrasts between light and dark. We used primarily charcoal and usually began by covering the entire paper with a charcoal base and then using erasers and more charcoal to establish the lights and darks. We also worked on perspective. 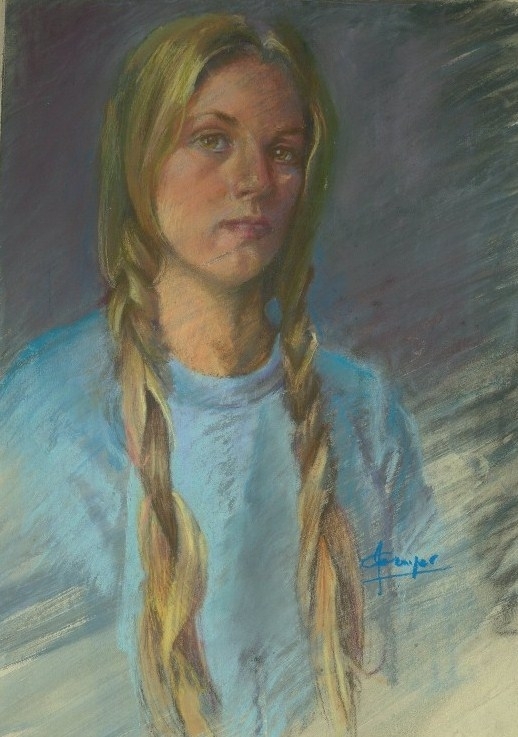 As it turns out, Jennifer was a gifted portrait painter, and chiaroscuro is a common technique in figure drawing. While the class was very different than I expected, it was very good for me because it taught me to see contrast and value. We also learned some basic techniques like drawing the negative space, which is sometimes very helpful, especially with composition. I went on to take a second class through the county with Jennifer in figure drawing and painting and then a third where she had a group of students take a portrait painting class in her home. I never imagined myself painting portraits, but it was a very good experience. 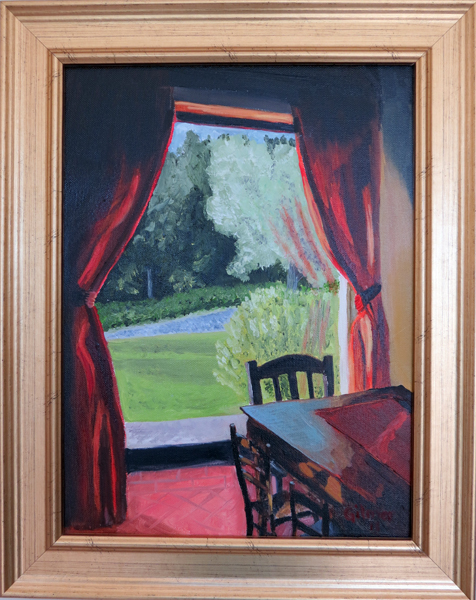 It was also my first exposure to oil painting – I had always used acrylics before that point. 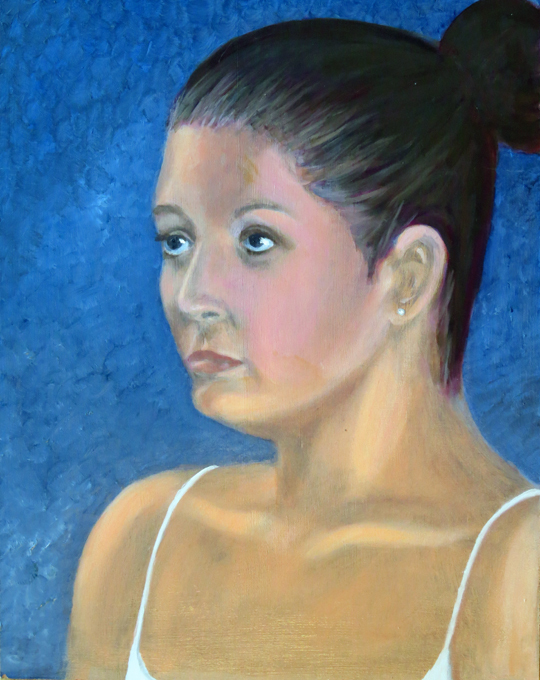 Below is the portrait I painted in Jennifer’s private class. Sadly, I haven’t done anything in portrait painting since. When I picked up my paintbrushes again in 2013 I thought I might try to take another class from her. I looked her up and learned that she passed away in 2010 at the age of 61, far too young to lose such a gifted artist. Below is the only example I could find of Jennifer’s work on Google. 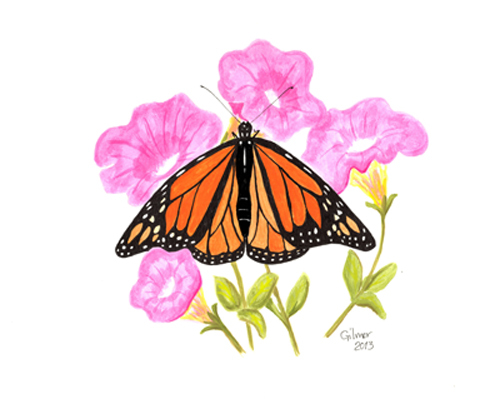 Butterflies inspire me. They are delicate and colorful and beautiful. 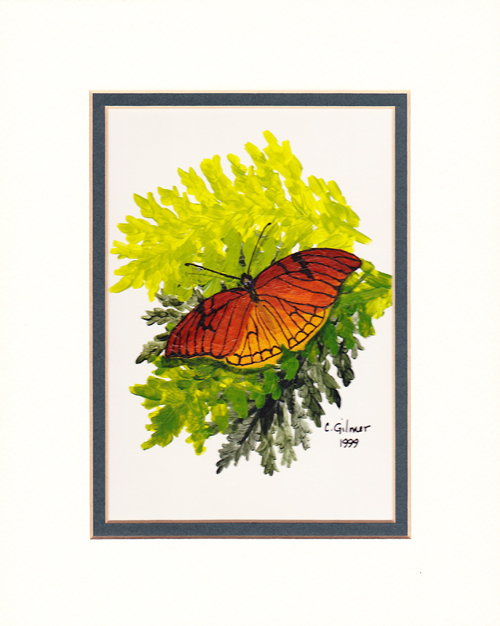 When I started painting I had some photographs of butterflies and decided they would be great subjects. 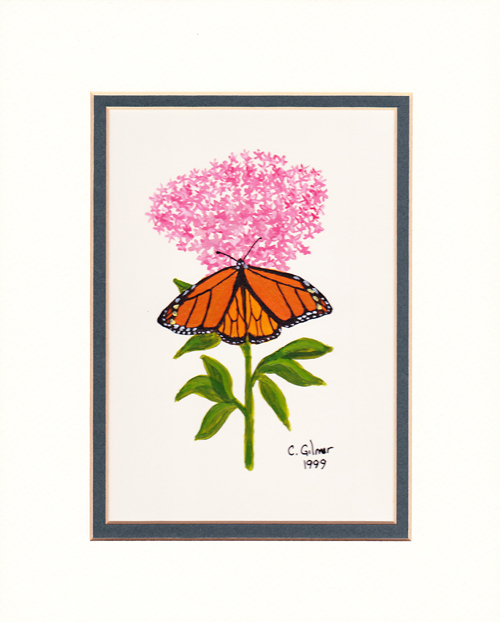 I did my very first butterfly pictures in regular acrylic paints on paper. Acrylic was all I had and I hadn’t really explored other alternatives. They came out well, but the acrylic paint was heavy on the paper. Around the same time, my sister told me about gouache. She had done a painting for me from a trip we took together to Germany and it is gouache and pencil. I’ve always loved the look and thought the paint looked sheer and classy. 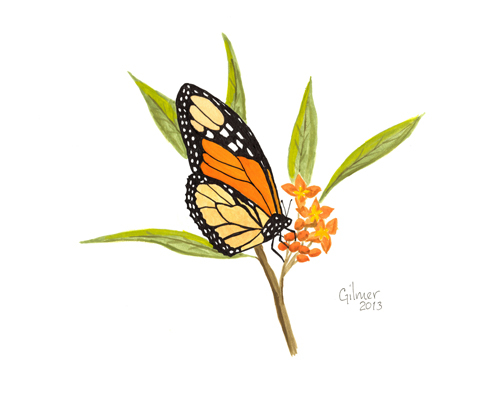 I decided to try my next butterfly in gouache. What is so fun about painting a butterfly is getting into the patterns on the wings. The good news is that they don’t match exactly. If they did, my engineer’s brain would obsess about getting them to match and I’d never be able to finish the painting. 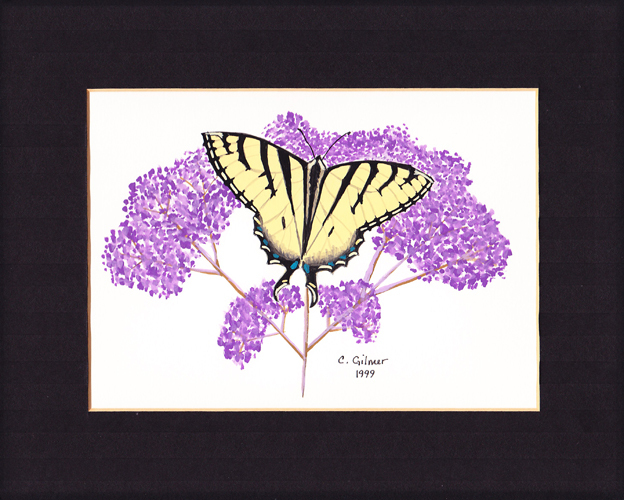 I really liked my swallowtail that I did in gouache. I scanned it in and still use it as letterhead for my personal stationery and cards. A few years ago after several years of not painting at all I was struggling to get my eye and my technique back. I decided that I needed to do some butterflies. The good news is that there’s not a huge time commitment. The gouache is tidy so there’s minimal set up and clean up and you can focus your time on doing the painting. 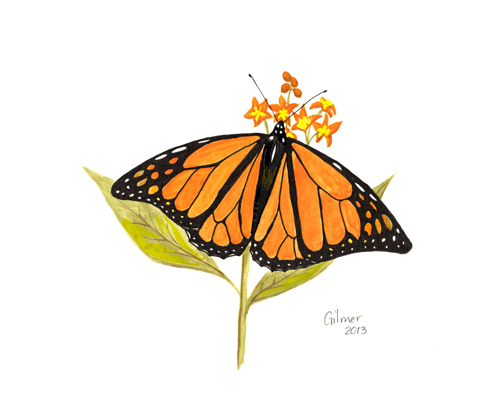 For these more recent butterflies I used gouache but did most of the black on the wings with ink. I recently entered these in the Loving Life show (October 2014) at Falls Church Arts. They did not win anything nor did they sell, but they got a nice spot right by the door. I was also proud that they were selected, as this was my first curated show.